Written by veteran aerospace journalist Bob Ward, who spent years investigating his subject, this biography presents a revealing but even-handed portrait of the father of modern rocketry. As he chronicles Wernher von Braun's life, Ward explodes many myths and misconceptions about the controversial genius who was a hero to some, a villain to others. 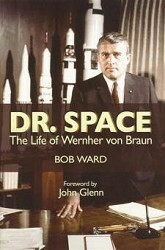 The picture of von Braun that emerges is of a brilliant scientist with limitless curiosity and a drive to achieve his goals at almost any price—from developing the world's first ballistic missile used against the Allies in World War II to helping launch the first U.S. satellite that hurled Americans into space and the Saturn V super-booster that powered them to the moon. Along the way readers are introduced to the human side of this charismatic visionary who brought the United States into the Space Age.